About 80% of European Union households have access to broadband via next-generation access technologies such as VDSL, fiber-to-the-premise and DOCSIS 3.0, a recent report finds. That number most likely has already grown, since the research is part of the European Commission's "Broadband Coverage in Europe 2017," released June 22. 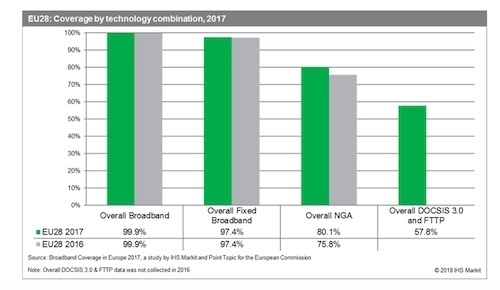 The 80.1% of EU households covered by so-called NGA technologies make up 176 million residences (9.9 million more than in 2016) -- or 79% of EU households, the report by IHS Markit and Point Topic found. Only Malta offers all residents the option of high-speed broadband connectivity, the report found. But Switzerland, Belgium, the Netherlands, Iceland and Portugal accomplished country levels above 95%, researchers determined. On the flip side, at 49.6% Greece had the least proportion of residential customers covered by NGA networks, the EU study said. Other nations that ranked poorly included Bulgaria, Romania, Croatia, Poland and France, all of which covered less than 75% of households with NGA networks by the end of July 2017. Malta had about nine commercial broadband providers, a number that decreased in late 2017 when Vodafone Malta merged with Melita, Malta’s leading cable, broadband and pay-TV provider, with a network covering 99% of Maltese households. On the other hand, Slovenia uses a mix of government and private operators to make NGA networks available to 83.2% of households -- including 53.9% of rural residences, according to the IHS Markit and Point Topic report. The government's Slovenia 2020 initiative expects 96% of homes to have access to 100Mbit/s and the remainder to be able to avail themselves of 30Mb/s by 2020, the EU report said. For its part, this month, Slovenia's broadband providers must meet a "universal services obligation" -- a minimal package of services made accessible to all users across the country at the same price, regardless of cost to the operator, Slovenia Times reported. Even if it is unprofitable commercial providers must deliver 4Mbit/s download speeds, the newspaper said, regarding a mandate by the country's Agency for Communication Networks and Services (AKOS). Designed to help Slovenia close its digital divide, the government originally wanted 10Mbit/s speeds but providers rallied against that requirement, an official told the local paper. In light of Slovenian homes' widespread access to slower broadband -- via mobile, satellite, older DSL or cable infrastructure -- this universal mandate appears the first step in an upgrade or replacement program ultimately designed to help the Eastern European nation attain its 2020 vision.